The luxury hotel market, once concentrated in only the largest cities, has surged over the last decade. Jay Stein, the chief executive at the Dream Hotel Group, has taken advantage of the demand, shining a light on a company that helped cultivate one of the most popular trends in modern upscale lodging. The company, which includes the Chatwal New York and Time Hotels, currently operates 18 properties. There are plans for 30 additional hotels internationally over the next four years, from a Dream hotel in Belize to boutique-oriented Unscripted hotels in Birmingham, England, and Tulum, Mexico. Below are edited excerpts from a conversation with Mr. Stein in Manhattan. How has Dream influenced the growth within the New York luxury market? What changes have you seen in this market over the last five years? In the 1960s and 70s, a lot of hotels were boxy and didn’t differentiate themselves. That wouldn’t work today. The increased competition in the New York market over the last few years, with new hotels like the Baccarat Hotel, has forced everyone to look at what they’re doing and really perform everything well. There is more of a hip, cool trend at many hotels, blending lifestyle and luxury. With the growth of boutique hotels, what factors are considered when determining how a Dream property would fit into a particular market, especially midsize cities? We analyze profitability and perform our own research to see if a market is viable. In places like Durham, N.C., and Nashville, there is a demand for more lifestyle hotels, which would have not have been the case a decade ago. People are a lot more exposed to the world than they used to be. 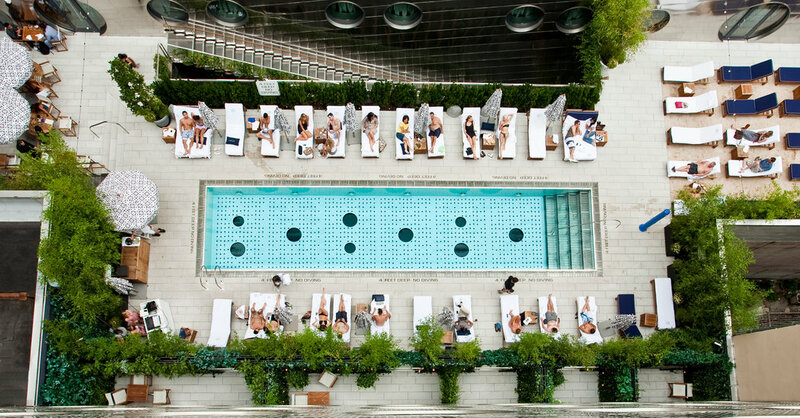 The Dream Downtown New York hotel opened in the former National Maritime Union Building, a 1960s-era concrete structure with porthole windows and a glass-bottomed pool that sits over the lobby. What went into creating and preserving the property? The building (355 West 16th Street) had some challenges since it was inside the block, to the east of the Maritime Hotel. I met with Handel Architects and we took a look at the building, adding a second tower, new porthole windows and a volleyball area with sand. The stainless steel cladding defines the exterior of the building. You’re planning to open two hotels in the Dominican Republic. Are you looking at other parts of the region? The Caribbean is a new market for us, and Belize is one of the fastest growing tourist areas in the region. We have plans for two new hotels in Belize, an Unscripted hotel in late 2018 and a Dream hotel in 2020. What has been your most memorable hotel opening? At the Dream Downtown, we were painting the baseboards minutes before the opening. We were hosting a hospitality conference, so we were committed to opening on time. The hotel has 315 rooms and there were about 300 industry professionals at the conference, and we pulled it off. When you visualize an ideal vacation, what comes to mind? Do you have a favorite destination? Winter in the Green Mountains of Vermont is my favorite. I’m an avid skier, and seeing the covered bridges and mountains near Sugarbush [Resort], Jay Peak, Stowe and Williston is great. Going out to a hot tub with three feet of snow is the ultimate vacation. You recently opened the first Unscripted hotel, Unscripted Durham, in North Carolina. The property, a former 1960s-era motor lodge, was turned into a 74-room boutique hotel. What is your vision for the Unscripted brand? We’re focused on secondary and tertiary markets where there aren’t a lot of boutique options and where we can offer a great lifestyle product. Roughly 10 miles from downtown Austin, we’re planning a hotel that will be attached to a live music venue.